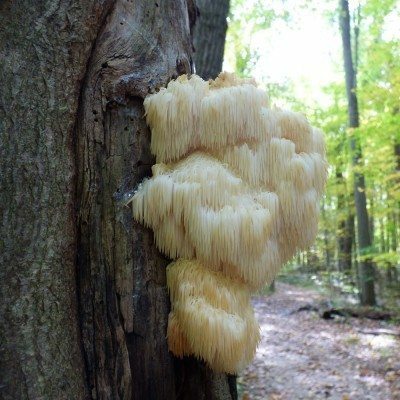 The bearded tooth mushroom, also known as lion’s mane, is a culinary delight. 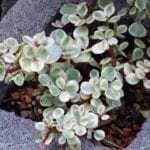 You can occasionally find it growing in shady forests, and it’s easy to cultivate at home. Read on to find out more about this tasty treat. What is Bearded Tooth Fungus? Bearded tooth is a mushroom that you can feel confident about collecting in the wild because it has no look-alikes, either poisonous or non. Although they aren’t common, you can sometimes find them in the fall in shady forests. The bearded tooth fungus habitat is the trunks of old beech or oak trees. The mushrooms grow in wounds in the tree trunk, and they are a sign that the tree has heart rot. You may also find bearded tooth growing on fallen or felled trees. When you find them, make a note of the tree and its location. The mushrooms come back in the same location year after year. Bearded tooth, or lion’s mane, mushroom (Hericium erinaceus) has a distinctive appearance. It looks like a cascade of white icicles measuring between three and ten inches wide. The individual “icicles” grow as much as 2.75 inches long. These stemless mushrooms produce spores on small, white teeth close to the surface of the wood. Bearded tooth mushrooms are white at first, and then turn yellow to brown as they age. You can collect them regardless of the color because the flesh remains firm and flavorful. While other mushrooms tend to grow around the base of a tree, bearded tooth often grows higher up, so you may miss them if you focus on the ground. Kits to grow bearded tooth mushrooms are available online. There are two ways to go. Spawn plugs are small wooden dowels containing the spawn. After you drill holes in a beech or oak logs, you pound the dowels into the holes. It can take several months, or even up to a year to get your first harvest from this method. The advantage is that you get a lot of mushrooms over a period of several years. For quick results, you can buy kits already infused and ready to start producing. You may get your first mushrooms in as little as two weeks after initiating the kit. With good care, you can get several flushes of mushrooms from this type of kit, but they rarely last more than a couple of months.